As it was sundry times acted by the seruants of the right Honourable the Earle of Sussex. Imprinted at London by Simon Stafford, for Cuthbert Burby: And are to be sold at his shop neere the Royall Exchange. 1599. 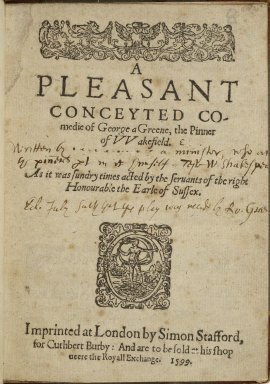 Title page imaged from Folger call number: STC 12212. Image is not from the transcribed copy. Wiggins suggests a best-guess creation date of 1591; range 1587–92.